Discover how to enhance your cross-country skills and how to spot clouds that hold the promise of guaranteed lift, and then read what happens when it all comes together in John Williams’ account of his world record claim. This, along with an overview of theinternational vintage gliding scene from Chris Wills, makes the Feb/March issue of S&G essential reading. Last year John Williams returned from Argentina with just one hour in his log book. 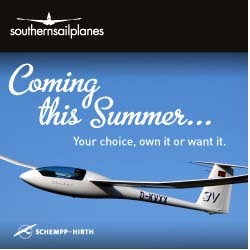 This January he returned with claims for a world record, a 1,500km FAI diploma and 10 UK National records. John shares his immediate reflections on this lifetime experience and reveals why Argentina should be on every glider pilot’s bucket list. When professional meteorologist and TV weatherman Simon Keeling fulfilled an ambition to go solo in a glider, he discovered that not all clouds are as portrayed in meteorological texts. Simon has been investigating ways of spotting clouds with the potential promise of guaranteed lift. In cross-country gliding, decision-making is critical. Iain Baker looks at how by achieving the right combination of physical, mental and emotional conditions you can generate enhanced performance levels, in his thought-provoking article Zen and the art of cross-country gliding. This year’s Vintage Glider Club International Rally is taking place at Tibbenham. There is a lot of interest and activity in what is the world’s largest gliding club. 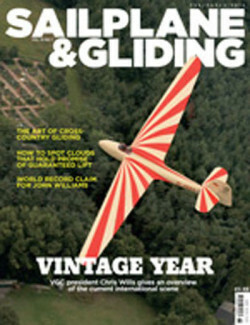 Founder and VGC President Chris Wills gives an overview of the current international vintage glidingscene. Also in this issue: BGA Chairman Patrick Naegeli reflects on a year that has provided a strong base from which we can continue to move our sport on, with a continued focus on safety in addition to a new set of development initiatives for UK gliding. BGA Development Officer Alison Randle looks at ways of protecting the financial health of your club, and reports on the Try Fly Days held by 20 clubs taking part in a government-funded initiative. Jochen Ewald reports on the 2009 Idaflieg meeting. Steve Longland focuses on the compass in the fourth part of his series on how aircraft instruments work. 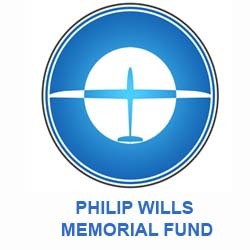 Wally Kahn looks at cross-Channel flightsand reminisces about his own experiences and Philip Wills’ memorable flight in 1957. Pete Stratten road tests a new towcar on an1,800 mile out-and-return and shares some basic towing tips. Al Machinchy tells how flying model aircraft for a living helped hisspeedy progression as a novice to gliding. National Coach Mike Fox has advice for both the experienced and novice pilot with an article on getting the approach right. Christopher Claxton shares his excitement of rediscovering gliding with his new toy, a Discus Turbo. Dr Colin Jackson reveals that research shows a new material, Confor, is suitable for use in energy-absorbing cushions.